The Chief of Voluntary Services of our local Veterans’ Administration Hospital requested a patriotic wall quilt to hang in or near her office. I volunteered to make one for her. A plaque honoring the Tarheel Quilters Guild will accompany the quilt because our guild has provided lap quilts for the veterans for more than 30 years. We make quilts throughout the year and present them either in December (formerly) or February (recently). Those who view the quilt as it hangs in the hospital will not realize all the symbolism it embodies, but I will give you the inside scoop. To celebrate our guild’s thirty years of volunteer service, I fused old quilt styles with new ideas and fabrics. 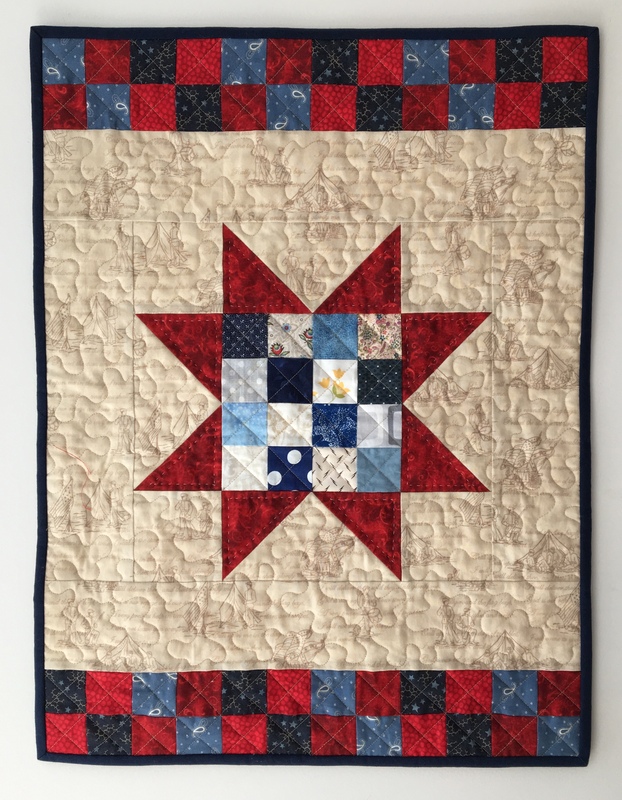 “Saw Tooth Star,” “Four Patches,” and “Postage Stamp” are all time-honored patchwork designs; however, I floated the star in negative space, and the quilt has no border which characterize some modern quilts. The tan background depicts Civil War soldiers with patriotic as well as Scriptural text – very appropriate for veterans. Some of the “Postage Stamp” squares are Civil War reproduction prints and some, like the yellow flower, are contemporary. For quilting designs, I chose cross-hatching (an old-fashioned motif) and meandering (a machine quilting favorite). I elected to hand quilt the points of the stars because thirty years ago all of us Tarheel Quilters were hand quilting! We were also using Mountain Mist polyester batting then, but I used today’s preferred Warm and Natural cotton batting. As a U.S. Army chaplain’s wife and the mother of a veteran, I gladly volunteered to make this quilt which honors both our quilt guild and the service members they have comforted for thirty-plus years. Tip: I drew a chalk line 1/4″ away from the edges of the “Four Patches.” I pivoted my cross-hatching machine stitching when I reached the line. 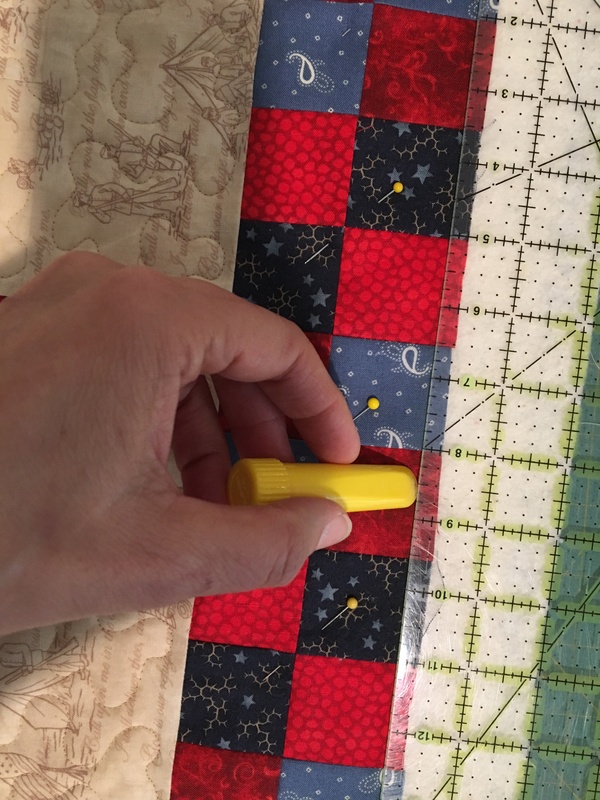 I cut binding strips 2 1/4″ wide, joined them, pressed them in half, and applied them with a 1/4″ seam allowance so as not to cover the pivot points of the cross-hatching. Love this quilt and congratulations to your guild for their many years of service.